Abstract: A high resting heart rate (≥70–75 b.p.m.) is a risk factor for patients with heart failure (HF) with reduced ejection fraction (EF), probably in the sense of accelerated atherosclerosis, with an increased morbidity and mortality. Beta-blockers not only reduce heart rate but also have negative inotropic and blood pressure-lowering effects, and therefore, in many patients, they cannot be given in the recommended dose. Ivabradine specifically inhibits the pacemaker current (funny current, If) of the sinoatrial node cells, resulting in therapeutic heart rate lowering without any negative inotropic and blood pressure-lowering effect. According to the European Society of Cardiology guidelines, ivabradine should be considered to reduce the risk of HF hospitalization and cardiovascular death in symptomatic patients with a reduced left ventricular EF ≤35% and sinus rhythm ≥70 b.p.m. despite treatment with an evidence-based dose of beta-blocker or a dose below the recommended dose (recommendation class “IIa” = weight of evidence/opinion is in favor of usefulness/efficacy: “should be considered”; level of evidence “B” = data derived from a single randomized clinical trial or large nonrandomized studies). Using a heart rate cutoff of ≥ 75 b.p.m., as licensed by the European Medicines Agency, treatment with ivabradine 5–7.5 mg b.i.d. reduces cardiovascular mortality by 17%, HF mortality by 39% and HF hospitalization rate by 30%. A high resting heart rate is not only a risk factor in HF with reduced EF but also at least a risk marker in HF with preserved EF, in acute HF and also in special forms of HF. In this review, we discuss the proven role of ivabradine in the validated indication “HF with reduced EF” together with interesting preliminary findings, and the potential role of ivabradine in further, specific forms of HF. HF is not a homogenous entity (Table 1) but consists3 of HF with reduced ejection fraction (HFrEF; LVEF < 40%; “systolic” HF), of HF with preserved ejection fraction (HFpEF4; LVEF ≥ 50%; “diastolic” HF) and – according to the 2016 version of the ESC HF guidelinew – HF with mid-range ejection fraction (HFmrEF; LVEF 40–49%) of either ischemic or nonischemic origin. All these forms can present as acute HF, as chronic stable HF or as decompensated chronic HF. Note: For patients with HFmrEF, no prospective trials with ivabradine are yet available. Abbreviations: CM, cardiomyopathy; EU, European Union; HF, heart failure; HFmrEF, heart failure with mild-range ejection fraction; HFpEF, heart failure with preserved ejection fraction; HFrEF, heart failure with reduced ejection fraction; MODS, multiple organ dysfunction syndrome; OHCA, out-of-hospital cardiac arrest; ROSC, return of spontaneous circulation. Evidence-based treatment of all these different forms of HF is shown in the European3 and the American5 HF guidelines. Ivabradine should be considered to reduce the risk of HF hospitalization and cardiovascular death in symptomatic patients with LVEF ≤ 35%, in sinus rhythm and a resting heart rate ≥ 70 b.p.m. despite treatment with an evidence-based dose of beta-blocker (or maximum tolerated dose below that), an ACE inhibitor (or ARB) and an MRA (or ARB) (IIa/B) (recommendation class “IIa” = weight of evidence/opinion is in favor of usefulness/efficacy: “should be considered”; level of evidence “B” = data derived from a single randomized clinical trial or large nonrandomized studies). Ivabradine should be considered to reduce the risk of HF hospitalization and cardiovascular death in symptomatic patients with LVEF ≤ 35%, in sinus rhythm and with a resting heart rate ≥ 70 b.p.m. who are unable to tolerate or have contraindications for a beta-blocker. Patients should also receive an ACE inhibitor (or ARB) and an MRA (or ARB) (IIb/C) (recommendation class “IIb” = usefulness/efficacy is less well established by evidence/opinion; level of evidence “C” = consensus of the opinions of the experts and/or small studies, retrospective studies and registries). In Germany, ivabradine (ivabradine hydrochloride as Procoralan® [Servier, Neuilly-sur-Seine, France]; 5 mg/7.5 mg film-coated tablets; starting dose 5 mg b.i.d., target dose 7.5 mg b.i.d.) is licensed for patients with chronic HF (NYHA II–IV) with systolic dysfunction who have sinus rhythm with a heart rate ≥ 75 b.p.m. It is used in combination with standard therapy including beta-blockers, or in patients who cannot be treated with beta-blockers. For the sake of reproducibility, resting heart rate in patients should be measured in a standardized manner, with a resting phase of 5 (to 10) min before measurement, with at least two pulse measurements in sitting position with a duration of at least 30 s.
For the largest patient group, those with chronic HFrEF, Table 2 presents the prognostic relevance of a high resting heart rate (≥75/min vs. < 75/min) with respect to mortality and hospitalization because of HF, both in a large RCT (SHIFT study) and in a registry of ambulatory care. Notes: SHIFT study:27 data are given from patients of the placebo group (sinus rhythm ≥ 70/min; LVEF ≤ 35%; NYHA II–IV) under standard heart failure treatment including beta-blocker and excluding ivabradine. Of the total patients, 64.3% had a resting heart rate ≥ 75/min, with a higher value of the primary end point and the secondary end point “mortality” than those with a resting heart rate < 75/min. Registry data:30 data are given from patients from outpatient clinics (sinus rhythm; LVEF ≤ 35%; NYHA II–IV), with standard heart failure treatment including beta-blocker and excluding ivabradine. Of the total patients, 53% had a resting heart rate ≥ 75/min, with a higher value of the primary end point and the secondary end point “mortality” than those with a resting heart rate < 75/min. Abbreviations: LVEF, left ventricular ejection fraction; NYHA, New York Heart Association; RR, relative risk. A high heart rate also indicates an unfavorable prognosis in specific forms of acutely life-threatening disease states with impaired heart function (explained in the “Specific forms of HF” section and Table 1). 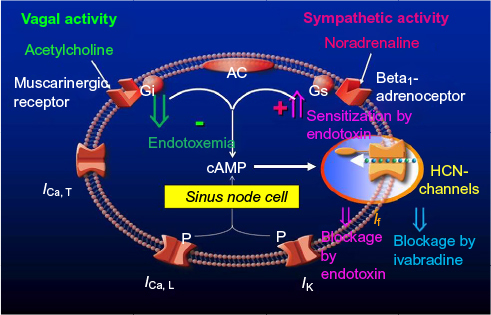 Figure 1 Effects of endotoxin on pacemaker current If (HCN channels) and adrenergic pacemaker current If stimulation in human atrial cardiomyocytes. Notes: Endotoxin not only inhibits If but also intensifies beta-adrenoceptor-mediated stimulation of If.36 If inhibition by endotoxin is not an unspecific effect, as the L-type calcium current is not inhibited by endotoxin. ⇑ indicates stimulation and ⇓ indicates inhibition. Abbreviations: AC, adenylyl cyclase; cAMP, cyclic adenosine monophosphate; Gi, inhibitory G protein; Gs, stimulatory G protein; HCN, hyperpolarization-activated cyclic nucleotide-gated; ICa,T, T-type calcium current; ICa,L, L-type calcium current; If, “funny” current; IK, potassium current. In therapeutic concentrations (starting dose 5 mg b.i.d., target dose 7.5 mg b.i.d. ), the If inhibitor ivabradine binds to HCN channel proteins in the sinoatrial node, thereby reducing the slope of If , with consecutive lowering of heart rate in patients with sinus rhythm. With respect to the heart, the action is specific for the sinoatrial node, with no other effects, either on intraatrial, atrioventricular (PQ interval) or intraventricular conduction time or on myocardial contractility or ventricular repolarization (QTc interval). Also, blood pressure is not altered. HRV is considered as a measure of autonomic nervous system function, and a reduced HRV has been identified as an independent predictor of cardiac events and death in the general population without apparent heart disease,47 and also in those with chronic cardiac disease such as systolic HF.48 These results support the concept of autonomic imbalance with sympathetic overactivity as an important feature in HF. Heart rate in general49 and also selective heart rate reduction by ivabradine are inversely correlated to HRV, as shown in a study with conscious rats.50 Improvement of HRV with ivabradine was blocked in this model by administration of the beta-blocker propranolol or the muscarinic antagonist atropine, indicating the critical importance of the two components of the autonomic nervous system. Treatment should be started with 5 mg ivabradine b.i.d. (in patients > 75 years: 2.5 mg b.i.d.). After 3–4 weeks, dosage can be increased in the still symptomatic patients to the maximum dose of 7.5 mg b.i.d. In case of lowering of the heart rate < 50 b.p.m. or in case of symptomatic bradycardia under treatment, dosage should be reduced down to a minimum of 2.5 mg b.i.d. Treatment must be stopped if – despite dose reduction – heart rate remains < 50 b.p.m. or symptomatic bradycardia persists. The intravenous route57,58 is still experimental and not approved for clinical use. Though cardiodepression is in the focus of cardiac impairment, endotoxin also interferes with the rhythm: in human atrial cardiomyocytes which also bear HCN channels as do sinoatrial node cells, endotoxin was found to significantly impair If by suppressing the current at membrane potentials positive to –80 mV and slowing down current activation, but without effecting maximal current conductance. In a model of a spontaneously active sinoatrial cell, endotoxin-induced If impairment reduced the responsiveness of the model cell to fluctuations of autonomic input, thereby reducing heart rate variability between 38% and 62%.36 This endotoxin effect is not mediated by any of the intracellular modulatory pathways affecting HCN channels, but is instead due to a direct interaction with the channel.60–62 In addition to this direct inhibitory effect of endotoxin on If , endotoxin in human atrial cardiomyocytes also sensitizes If to beta-adrenergic stimulation, thereby increasing heart rate.36 In mice in vivo, endotoxin does not lower but increase heart rate,63 as can also be seen in humans. However, when autonomous nervous system in these mice is blocked by propranolol and atropine, endotoxin induces a significant reduction of heart rate.63 Thus, both effects can be demonstrated in the mice, while under in vivo conditions, the positive chronotropic effect of endotoxin by sensitization of If to the positive chronotropic beta-adrenoceptor stimulation prevails the direct negative chronotropic effect on If. The SHIFT (“Systolic Heart failure treatment with the If inhibitor ivabradine Trial)16 is the landmark trial for ivabradine treatment of patients with chronic HFrEF: 6,558 patients with stable (≥4 weeks), chronic symptomatic HF under standard medication, an ejection fraction of ≤ 35%, a previous admission to hospital for worsening HF within the previous 12 months and sinus rhythm ≥ 70 b.p.m. were additionally treated using standard regimen with either placebo or ivabradine. Ivabradine regimen was started with 5 mg b.i.d., and the dose was either maintained if resting heart rate was between 50 b.p.m. and 60 b.p.m. or increased to 7.5 mg b.i.d. unless the resting heart rate was 60 b.p.m. or lower. Demographic data were as follows: mean age 60 years, 77% male; mean heart rate 80 b.p.m. ; mean RRsyst 122 mm Hg; mean LVEF 19%, NYHA II/III 49%/50%, ischemic origin 68%; treatment with beta-blockers 90%, ACE inhibitors 79%, ARB 14%, diuretics 84%, MRAs 61% and cardiac glycosides 14%. Excluded were patients with HF due to congenital heart disease or primary severe valvular disease. After a median follow-up for analysis of 22.9 months (interquartile range 18–28 months) with a mean ivabradine dosage of 6.4 ± 1.6 mg b.i.d. at day 28 and 6.5 ± 1.6 mg b.i.d. at 1 year, the primary end point – composite of cardiovascular death or hospital admission for worsening HF – was achieved in 29% in the placebo group, but only in 24% in the ivabradine group, representing a significant relative reduction of 18% (HR 0.82; 95% CI 0.75–0.90; p < 0.0001). The effects were driven mainly by hospital admissions for worsening HF (21% vs. 16%; HR 0.74; 95% CI 0.66–0.83; p < 00001), while cardiovascular death was not significantly different (15% vs. 14%; HR 0.91; 95% CI 0.80–1.03; p = 0.128). However, deaths from HF were significantly reduced (5% vs. 3%; HR 0.74; 95% CI 0.58–0.94; p = 0.014). Five percent of ivabradine patients had symptomatic bradycardia compared with 1% of the placebo group (p < 0.0001). Visual side effects (phosphenes) occurred in 3% of patients on ivabradine and in 1% of patients on placebo (p < 0.0001). In view of the positive SHIFT data, the neutral data of the BEAUTIFUL trial29,68 with 10,917 patients are a bit surprising. No beneficial effect of ivabradine in these patients with stable coronary artery disease and LV dysfunction (mean LVEF 32%) was seen with respect to cardiovascular death and to admission to hospital for acute myocardial infarction, and for new onset or worsening HF, either in the total population (heart rate ≥60 b.p.m.) or in the prespecified subpopulation (49%) with a heart rate ≥70%. In the SHIFT, 100% of the patients had symptomatic HF (NYHA II: 49%; NYHA III: 50%; NYHA IV: 2%), and in the BEAUTIFUL trial, 84% had symptomatic HF (NYHA I: 15%; NYHA II: 61%; NYHA III: 23%). From this comparison, it becomes evident that patients in the SHIFT had more severe symptomatic HF than those in the BEAUTIFUL trial. Also, another aspect might add to the discrepancy: in view of the SHIFT analysis, one could also speculate that patients with nonischemic HF might benefit even more (primary composite end point: HR 0.72; 95% CI 0.60–0.85) than patients with ischemic HF (HR 0.87; 95% CI 0.78–0.97; test for interaction, p = 0.59). And finally, a word of caution may be allowed, though concerning patients without HF. In patients with stable coronary artery disease and sinus rhythm ≥70 b.p.m., but without clinical HF, ivabradine is of symptomatic but not of prognostic value, as shown in the SIGNIFY trial.19 In the prespecified SIGNIFY subgroup of patients with angina Canadian Cardiovascular Society grade ≥2, even a higher incidence of the primary end point – cardiovascular death or nonfatal myocardial infarction – was observed (HR 1.18; 95% CI 1.03–1.35; p = 0.02). The EMA decision for a cutoff of ≥ 75 b.p.m. Abbreviations: EF, ejection fraction; f, heart rate; NYHA, New York Heart Association. The INTENSIFY study is a prospective, open-label, multicenter, nonintervention study.69 A group of 1,956 HFrEF patients with an initial sinus rhythm (85 ± 11 b.p.m.) were treated in German outpatient clinics with ivabradine (44.1% of patients received 5 mg b.i.d., 52.4% received 7.5 mg b.i.d. and 3.5% received 2.5 mg b.i.d.). After 4 months of treatment, heart rate has fallen down to 67 ± 8.9 b.p.m. In parallel with this heart rate reduction, the proportion of patients with signs of decompensation fell from 22.7% initially to 5.4%, and the proportion of BNP levels > 400 pg/mL dropped from 53.9% to 26.7%. This coincided with a reduction in NYHA class from 9.6% (I), 51.1% (II), 37.2% (III) and 2.1% (IV) initially to 24.0% (I), 60.5% (II), 14.8% (III) and 0.7% (IV), respectively. After 4 months, the physicians rated the effectiveness of ivabradine as very good in 54.9% of patients and good in 41.5%. Tolerability was rated by the physicians as very good in 68.2% and good in 31.0%. At least one adverse event occurred in 2.9% of patients treated with ivabradine, with 1.4% being cardiac events, 0.5% related to the nervous system and 0.5% being eye events. Bradycardia (0.3%) was mainly seen in patients with an initial heart rate < 75 b.p.m. In 4.4% of the patients, the study drug was discontinued for different reasons (patient’s request: 50%, insufficient efficacy: 14.1%, intolerance: 20.5%, lack of compliance: 15.4%, other reasons: 29.5%). During this 4-month period, 0.3% of patients died, reflecting a low-risk chronic systolic heart failure outpatient cohort. In summary, the INTENSIFY study documented over a 4-month period of treatment that ivabradine – in 77.8% given in addition to a beta-blocker – can effectively reduce heart rate and symptoms in patients with HFrEF under daily clinical practice.69 A similar heart rate reduction and safety profile of ivabradine were also reported in the ADDITIONS study70 on 2,330 patients with stable angina pectoris. Needless to say that nonintervention trials such as the INTENSIFY study as well as the ADDITIONS study have well-known limitations: they were not blinded, they were not placebo controlled and both studies had a relatively short follow-up of 4 months. Abbreviations: CI, cardiac index (L ×min–1×m–2); DAP, diastolic arterial pressure (mm Hg); HR, heart rate (min–1); LVSW, left ventricular systolic work (g); MAP, mean arterial pressure (mm Hg); PADP, pulmonary arterial diastolic pressure (mm Hg); PAMP, pulmonary arterial mean pressure (mm Hg); PASP, pulmonary arterial systolic pressure (mm Hg); PAWP, pulmonary artery wedge pressure (mm Hg); RAP, right atrial pressure (mm Hg); RVSW, right ventricular systolic work (g); SAP, systolic arterial pressure (mm Hg); SV, stroke volume (mL); SVR, systemic vascular resistance (dyn×s×cm–5); TPVR, total pulmonary vascular resistance (dyn×s×cm–5); h, hours. Patients with HFpEF suffer from exertional dyspnea and exercise intolerance. Ivabradine seems to be able to improve exercise-induced symptoms. Seventy-one patients with HFpEF (NYHA II/III; EF ≥50%; age 67 ± 9 years; 55% under beta-blocker treatment) in sinus rhythm (resting heart rate 72 ± 7 b.p.m. ), reduced exercise capacity (< 80% of normal range) and increased LV filling pressure during exertion were treated for 7 days with either 5 mg ivabradine twice daily or placebo.82 After 7 days, only the ivabradine group demonstrated a significant reduction in resting heart rate (62 ± 8 b.p.m. compared to baseline heart rate of 72 ± 7 b.p.m; p = 0.001), combined with a significant improvement in exercise capacity (from 4.2 ± 1.8 METs at baseline to 5.7 ± 1.9 METs, p = 0.001) as well as in peak oxygen uptake (from 14.0 ± 6.1 mL/min/kg to 17.0 ± 3.3 mL/min/kg; p = 0.001). The change in METs was greater in the treated patients than in controls (∆ 1.5 ± 1.2 METs vs. ∆ 0.4 ± 1.2 METs, p = 0.001) as was the change in peak volume of oxygen uptake (∆ 3.0 ± 3.6 mL/min/kg vs. ∆ 0.4 ± 2.7 mL/min/kg, p = 0.003). In parallel, the ivabradine group showed an improvement in resting LV lusitropic function, while the placebo group did not, with the intergroup difference being significant (p = 0.01). During exercise, LV filling pressure was reduced by ivabradine. 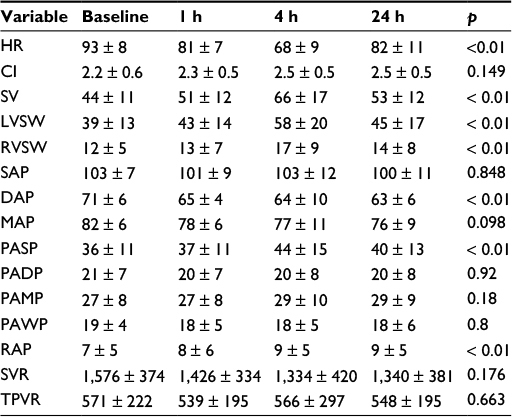 These positive short-time (7 days) effects of the randomized study82 have been extended to 12 months by an observational study83 with 48 HFpEF patients (NYHA II/III; 55 ± 10 years), treated with ivabradine (5 mg twice daily; in case if heart rate did not decrease < 75 b.p.m., 7.5 mg twice daily). After 1 month, resting heart rate had fallen from 85 ± 5 b.p.m. to 68 ± 4 b.p.m., exercise duration had increased from 6.1 ± 1.9 min to 7.1 ± 1.3 min, in parallel with an increase in peak oxygen uptake from 16 mL/min/kg to 18 mL/min/kg, and an improvement in diastolic dysfunction. These improvements remained stable thereafter for the full observation period of 12 months. Very similar positive findings of ivabradine in HFpEF patients were described up to 36 months by several groups.84–86 Switching from beta-blockers to ivabradine in patients with coronary artery disease and elevated LV filling pressure (E/e′ > 8) may cause a reduction in LV filling pressure and an improved SV response to exercise.84 On the other hand, Pal et al87 did not see these positive effects in a randomized, crossover study. They compared selective heart rate reduction by ivabradine (7.5 mg twice daily) with placebo for 2 weeks each in 22 symptomatic patients with HFpEF who had objective evidence of exercise limitation (peak oxygen consumption at maximal exercise < 80% of normal range) in comparison with 22 similarly treated matched asymptomatic hypertensive volunteers. Ivabradine selectively reduced peak heart rate compared with placebo in the HFpEF (107 b.p.m. vs. 129 b.p.m. ; p < 0.0001) and hypertensive (127 b.p.m. vs. 145 b.p.m. ; p = 0.003) cohorts. However, submaximal exercise capacity was not enhanced but reduced by ivabradine vs. placebo, and the same was true for the change in peak oxygen consumption (–2.1 mL/min/kg vs. 0.9 mL/min/kg). The authors87 state that the reasons underlying the discrepant results of their own and those of Kosmala et al82 are unclear, but may be due to the different age of the study patients – 74.6 ± 5.9 years87 vs. 66.5 ± 8.5 years.82 Older patients have an advanced chronotropic incompetence and a diminished SV reserve (a largely fixed SV) and are therefore more sensitive to heart rate reduction. The larger mean resting heart rate reduction from 77 b.p.m. to 57 b.p.m. achieved with 7.5 mg ivabradine twice daily in these older patients87 in comparison to the reduction of only 10 b.p.m. by ivabradine 5 mg twice daily in the younger patient group82 might support this hypothesis. Patients with cardiogenic shock complicating myocardial infarction (post-AMI CS) usually show a high heart rate, often aggravated by catecholamine therapy. A case report104 and a small randomized trial105 documented the heart rate-lowering effect of ivabradine in post-AMI CS patients and also reported some beneficial therapeutic effects. In the prospective randomized trial,105, 58 patients with post-AMI CS in sinus rhythm and after primary percutaneous coronary intervention were treated either with standard medical treatment (28 patients) or with standard medical treatment plus ivabradine (30 patients; starting with 2.5 mg b.i.d.) given orally or – in mechanically ventilated patients – by nasogastric route. Heart rate in the ivabradine group fell from 97.2 ± 6.8 b.p.m. initially to 86.9 ± 4.8 b.p.m. after 1 week, to 79.8 ± 5.5 b.p.m. after 4 weeks and to 65.7 ± 9.8 b.p.m. after 6 months. In the control group, the respective values were 94.6 ± 6.0 b.p.m. initially (intergroup difference: not significant), 90.5 ± 4.6 b.p.m. after 1 week (intergroup difference: not significant), 87.0 ± 6.9 b.p.m. after 4 weeks (intergroup difference: p < 0.005) and 81.9 ± 7.5 b.p.m. after 6 months (intergroup difference: p < 0.001). Better improvement in the ivabradine group occurred with respect to blood pressure stabilization, LVEF, LV diastolic dysfunction and NT-ProBNP. Two patients died in the ivabradine group, and four patients died in the control group. Patients in the ivabradine group did not experience adverse events. An inadequately high resting heart rate – as a component of autonomic dysfunction – is a well-known phenomenon in patients with septic shock106 and in critically ill patients with MODS107 in general. High heart rate in MODS patients is of prognostic relevance: in a study with 89 patients with MODS of septic and of non-septic origin108 (APACHE II score ≥ 20), median baseline heart rate was 83 b.p.m. in 28-day survivors and 92 b.p.m. in 28-day non-survivors (p = 0.048; aHR 2.3 for initial heart rate ≥ 90/< 90 b.p.m.). In a trial by Morelli et al,109 154 patients with septic shock and a heart rate of at least 95 b.p.m. were randomized either to a 96-h infusion with esmolol (25–2,000 mg/h) or to placebo. Esmolol reduced heart rate by 28 b.p.m. (control: –6 b.p.m. ), and all esmolol patients did achieve the prespecified heart rate corridor of 80–94 b.p.m., which was the primary end point. In the control group, 28-day mortality was 80.5%, and in the esmolol group, 49.4% (aHR 0.39; 95% CI 0.26–0.59; p < 0.001). In the MODIFY trial (protocol110), we prospectively randomized 70 patients with MODS (APACHE II score ≥ 20) of septic and non-septic origin with an elevated heart rate ≥90 b.p.m. to either a standard therapy or a standard therapy plus a 4-day treatment with ivabradine given by the enteral route (up to 7.5 mg b.i.d.). Primary end point was proportion of patients with a reduction of heart rate by at least 10 b.p.m. In the ivabradine group, initial heart rate fell after the 4-day treatment from an initial value of > 100 b.p.m. to < 90 b.p.m. ; 28-day mortality was not significantly different in both groups (Werdan et al, in preparation). Heart rate, a risk marker or risk factor? Future trials should answer the question whether the high heart rate as a component of septic cardiomyopathy106 and MODS108 is indeed a risk factor and not only a risk marker, and whether lowering of a high resting heart rate can indeed lower mortality in these patients. Bradycardia during targeted temperature management (TTM) of patients with Return-Of-Spontaneous-Circulation (ROSC) is a physiologic response to lower body temperature and has been associated with favorable outcome in smaller observational studies. This finding was confirmed in a large multicenter cohort of comatose ROSC patients with OHCA treated with TTM at 33°C (n = 447) and at 36°C (n = 430).111 These findings therefore define spontaneous bradycardia during TTM as a novel, early marker in ROSC patients after OHCA. Whether active heart rate reduction, for example, by beta-blocker or ivabradine, might improve prognosis remains to be tested. The SHIFT was designed to demonstrate prognostic effects of ivabradine in already well-treated HF patients on standard medication (including beta-blockers), but 11% of the study cohort did not receive beta-blockers due to intolerance or contraindications. Subgroup analyses revealed that ivabradine treatment without concomitant beta-blockers in these patients achieved a significant outcome benefit with a relative reduction of the primary end point of 32%, compared to placebo.112 Nevertheless, the drug is often used in combination with beta-blockers due to complementarity of action, which is described in the following paragraphs. Ivabradine has only little interactions with other cardiovascular drugs and can therefore be given together with the guideline-recommended standard medication for HF such as ACE inhibitors, beta-blockers, ARBs, MRAs, diuretics and cardiac glycosides. In the attempt to achieve therapeutic heart rate reduction in HFrEF patients, a synergistic approach of beta-blocker and ivabradine is often necessary: many patients do tolerate only suboptimal but not the recommended full doses of a beta-blocker because of objective or subjective side effects. Therefore, an additional heart rate-reducing agent is necessary to achieve the goal. In the SHIFT,112 89% of the patients had beta-blockers, but only 26% of them were at the target dose, and only 56% had at least ≥ 50% of the target dose, irrespective of the specific beta-blocker used in this trial (46% carvedilol, 25% bisoprolol, 14% metoprolol succinate, 10% metoprolol tartrate, 3% nebivolol, 2% other). The reasons for this suboptimal beta-blocker dosing were hypotension (44%), fatigue (32%), dyspnea (24%), dizziness (13%), bradycardia (6%) and others (9%). The reasons for nonprescription of beta-blocker in the 11% of the SHIFT patients despite strong guideline recommendation were COPD (37%), hypotension (17%), asthma (10%), cardiac decompensation (7%), dizziness or bradycardia (7%), fatigue (5%), Raynaud syndrome or peripheral arterial disease (5%) and others (13%). It is interesting to see that these absolute and relative contraindications to achieve full beta-blocker dosing are seen not only in the SHIFT with chronic HF patients16 but also in other large ivabradine RCTs testing patients with stable coronary artery disease with LV dysfunction (BEAUTIFUL trial)68 and without clinical HF (SIGNIFY trial).19 These beta-blocker contraindications are also prohibiting “real-life” noninterventional ivabradine trials with patients with HFrEF69 as well with chronic coronary artery disease.70 Therefore, there is a clear gap in achieving full therapeutic heart rate reduction with beta-blockers alone in many HF patients. This gap can be filled by combination with ivabradine, a drug with a remarkably low side-effect profile. In the SHIFT,16 significantly higher adverse event rates in the ivabradine group in comparison to the control group were only seen for symptomatic bradycardia (5% vs. 1%, drug withdrawal in 1% vs. < 0.02%), asymptomatic bradycardia (6% vs. 1%, drug withdrawal in 1% vs. < 1%), atrial fibrillation (9% vs. 8%, drug withdrawal in 4% vs. 3%, n.s. ), phosphenes (3% vs. 1%, drug withdrawal in < 1% vs. < 1%, n.s.) and blurred vision (1% vs. < 1%, drug withdrawal in < 1% vs. 1%, n.s.). In the noninterventional INTENSIFY study69 with addition of ivabradine for 4 months to standard HF medication, 2.9% of the 1,956 HFrEF patients reported at least one adverse event, most commonly affecting the heart (1.4%), the nervous system (0.5%) and the eyes (0.5%); bradycardia was detected in this study in 0.3% of patients (n = 5), and seen more common in the group with the baseline heart rate < 75 b.p.m. Not only prognosis but also exercise tolerance can be improved by the combination of beta-blocker and ivabradine in comparison to beta-blocker alone: in the CARVIVA HF trial114 with 131 HF patients (NYHA II/II, LVEF 27 ± 4.9%), ivabradine as well as the combination of carvedilol plus ivabradine after 12 weeks of treatment improved exercise tolerance and QoL, but carvedilol alone did not, though in all three patient groups, heart rate was reduced, which was strongest in the combination group. This can be explained by dominant negative effects of an increasing blockade of beta1-adrenoceptors with higher doses of beta1-selective beta-blockers. Such effects prevent upregulation of heart rate and cardiac output during physical exercise and result in reduced exercise capacity, which is additionally impaired by negative inotropic properties of beta-blockers. In contrast, treatment with ivabradine alone or in combination with low- or medium-dose beta-blockers allows adequate rise in heart rate with increasing sympathetic activation (induced by physical exercise), as ivabradine lacks any inhibitory effects on beta1-adrenoceptors and maintains cardiac conduction and contractility.115 Combination therapy therefore enables additive heart rate reduction without the negative effects that would be generated by high doses of an equivalent beta-blocker monotherapy. The findings presented argue for a reduction of heart rate to < 60/min or at least for a reduction of 10 b.p.m. in patients with HFrEF and sinus rhythm of ≥ 75 b.p.m., either by beta-blocker alone or by the combination of beta-blocker plus ivabradine. For treatment, the lower heart rate limit is either 50 b.p.m. or symptomatic bradycardia. As many HFrEF patients under beta-blocker have a heart rate ≥ 75 b.p.m., there is a need for a combination therapy of beta-blocker plus ivabradine in these patients. For patients with chronic stable angina pectoris, a combination preparation (Implicor®) is now on the market for use, with a fixed combination of metoprolol tartrate and ivabradine (25/5 mg, 50/5 mg, 25/7.5 mg, 50/7.5 mg). In the opinion of the authors, similarly, a combination product of beta-blocker and ivabradine would also be desirable for the indication of chronic systolic HF. QoL: a stepchild of HF therapy! Abbreviations: IVA, ivabradine; SD, standard deviation. Guideline-recommended HF medication is clearly focused on prolongation of life, but much less on improving QoL:119,120 ACE inhibitors and ARBs,120 beta-blockers114,119–121 and also the aldosterone antagonist eplerenone122 are neutral, or only modestly improve or at best delay the progressive worsening of QoL. A direct comparison of the effect of treatment with beta-blocker vs. ivabradine on QoL is presented in the APULIA study with 221 patients with typical symptoms and signs of HFrEF (< 50%) (NHYA II–IV; mean LVEF: 44 ± 5% in ivabradine group and 43 ± 6% in beta-blocker group; initial heart rate 72 ± 5 b.p.m. in ivabradine group and 72 ± 4 b.p.m. in beta-blocker group).119 According to the new HF classification of the ESC,3 these patients would now be classified as patients with HFmrEF. In addition to HF standard treatment without beta-blockers, 110 patients with contraindications to beta-blocker treatment received for 1 month ivabradine 5 mg b.i.d., and 111 patients received beta-blockers (50 patients bisoprolol 1.25 m b.i.d. ; 51 patients carvedilol 6.25 mg b.i.d.). Ivabradine treatment as well as beta-blocker treatment (Table 5, C–F) was associated with a significant improvement of physical functioning (p 0.001 vs. p 0.01), physical role (p 0.001 vs. p 0.01), general health (p 0.001 vs. p 0.03) and mental health (p 0.001 vs. p 0.01). But only ivabradine, not beta-blockers achieved a significant improvement in body pain (p 0.001 vs. p 0.5), vitality (p 0.01 vs. p 0.44), social functioning (p 0.01 vs. p 0.92), emotional role (p 0.01 vs. p 0.85), physical component summaries (p 0.01 vs. p 0.52) and mental component summaries (p 0.01 vs. p 0.80) (Table 5, C–F). Thus, an improvement in global physical and in global mental activity was only achieved by ivabradine treatment, but not by beta-blocker treatment. With respect to improvement of health-related QoL, the sum of data clearly favors ivabradine over beta-blockers. HF is a syndrome that predominantly affects the elderly (> 65 years), the old (> 75 years) and also the very old (> 85 years) patients. In these patient groups, drug efficacy and drug safety may be influenced by altered drug metabolism, by polypharmacy with drug interactions and by lower drug adherence. In view of this, the low side-effect profile of ivabradine proven in RCTs as well as in clinical practice (explained in the “Ivabradine fills the beta-blocker gap” section) is a great advantage. In the SHIFT, an age group analysis was carried out with 6,505 patients, categorized into the age groups “< 53 years” (n = 1,522), “53 to < 60 years” (n = 1,521), “60 to < 69 years” (n = 1,750) and “≥ 69 years” (n = 1,712).123 With advancing age, the percentage of women increased from 16% to 34%, as did the percentage of NYHA II/III from 45% to 59%, as well as the incidence of comorbidity, and creatinine clearance fell from 87 mL/min/1.73 m2 to 63 mL/min/1.73 m2. RRsyst rose with age from 118 mm Hg to 124 mm Hg, but heart rate fell from 81 b.p.m. to 79 b.p.m. The use of HF medications declined with increasing age for beta-blockers from 93% to 85% and for those with the beta-blocker target dose from 27% to 18%, for MRAs from 68% to 54% and for cardiac glycosides from 30% to 17%, while the use of ACE inhibitors (~ 80%) and ARB (~ 15 %) remained fairly constant. As expected, both age and heart rate separately contributed significantly to outcome. For each b.p.m. increase in heart rate, the relative risk of the primary end point (cardiovascular death and HF hospitalization) increased in the groups by 3.6%, 3.1%, 3.2% and 2.2%, respectively. Ivabradine uptitration reduced heart rate similarly in all age groups, by 11 b.p.m. The primary end point was reduced by ivabradine in all age groups, ranging from 38% (HR 0.62; 95% CI 0.50–0.78; p < 0.001) in the youngest patients < 53 years to 16% (HR 0.84; 95% CI 0.71–0.99; p = 0.035) in the oldest. Adverse events as bradycardia and phosphenes did not increase with increasing age, and in the Holter substudy, there were no episodes of severe bradycardia and no clinically relevant pauses with ivabradine in any age group. In the sum of data, ivabradine sustains its efficacy, low side-effect profile and patient adherence also in the old patients with HFrEF, and it is also safe when taking the comorbidity of the old patients into account. Especially in the elderly patients, HF is only one of a number of disease entities present. Therefore, medication for HF has to be considered within the scope of the total approach of disease management in the individual elderly patients. Cardiac drugs used should not interfere with other drugs and should not further impair but even improve health-related QoL which often is reduced because of comorbidities. Evaluate health outcomes well beyond acute hospitalization and encompass all-cause events and a person-centered perspective in affected individuals. With respect to our patients with HF, this means that our medication should not only prevent HF-related death and hospitalization but also improve QoL, which often is severely impaired due to the symptoms of HF. Further, our medication should not further deteriorate QoL by severe adverse events. And, we should know which target – symptomatic and/or prognostic? – we have to achieve. Having this in mind, ivabradine is a good candidate for a HF drug: its QoL profile is above average, and its side-effect profile is below average. Many HFrEF patients under standard medical treatment inclusive of beta-blocker have a resting heart rate of ≥75 b.p.m. (Table 2) and therefore might benefit from additional ivabradine treatment (Table 3). In these patients, a reduction of heart rate should be achieved by additional ivabradine to ≤ 60 b.p.m. or at least a reduction by > 10 b.p.m. within 4 weeks. If this goal can be achieved, then we can tell the patient that his cardiovascular mortality risk within the next 2.5 years will be lowered by 17%, his HF mortality risk will be lowered by 39%, his HF hospitalization risk will be lowered by 30% and his health-related QoL will probably improve. U. Müller-Werdan received a honorarium for a lecture from Servier. G. Stöckl is an employee of Servier (Medical Affairs). K. Werdan has been engaged in ivabradine clinical trials fully or partly supported by Servier, has received honoraria for lectures and manuscripts from Servier, was a member of the German ivabradine advisory board of Servier and received research grants for experimental and clinical ivabradine research from Servier. The authors report no other conflicts of interest in this work. Braunwald E. Heart Failure. JACC Heart Fail. 2013;1(1):1–20. Laribi S, Aouba A, Nikolaou M, et al. Trends in death attributed to heart failure over the past two decades in Europe. Eur J Heart Fail. 2012;14(3):234–239. Ponikowski P, Voors AA, Anker SD, et al. 2016 ESC Guidelines for the diagnosis and treatment of acute and chronic heart failure: the Task Force for the diagnosis and treatment of acute and chronic heart failure of the European Society of Cardiology (ESC). Developed with the special contribution of the Heart Failure Association (HFA) of the ESC. Eur Heart J. 2016;37(27):2129–2200. Tannenbaum S, Sayer GT. Advances in the pathophysiology and treatment of heart failure with preserved ejection fraction. Curr Opin Cardiol. 2015;30(3):250–258. Yancy CW, Jesup M, Bozkurt B, et al. 2013 ACCF/AHA guideline for the management of heart failure: executive summary: a report of the American College of Cardiology Foundation/American Heart Association Task Force on practice guidelines. Circulation. 2013;128(16):1810–1852. Levine HJ. Rest heart rate and life expectancy. J Am Coll Cardiol. 1997;30(4):1104–1106. Fox K, Borer JS, Camm AJ, et al; Heart Rate Working Group. Resting heart rate in cardiovascular disease. J Am Coll Cardiol. 2007;50(9):823–830. Heusch G. Heart rate in the pathophysiology of coronary blood flow and myocardial ischaemia: benefit from selective bradycardic agents. Br J Pharmacol. 2008;153(8):1589–1601. Colin P, Ghaleh B, Monnet X, Hittinger L, Berdeaux A. Effect of graded heart rate reduction with ivabradine on myocardial oxygen consumption and diastolic time in exercising dogs. J Pharmacol Exp Ther. 2004;308(1):236–240. Custodis F, Baumhäkel M, Schlimmer N, et al. Heart rate reduction by ivabradine reduces oxidative stress, improves endothelial function, and prevents atherosclerosis in apolipoprotein E-deficient mice. Circulation. 2008;117(18):2377–2387. Drouin A, Gendron ME, Thorin E, Gillis MA, Mahlberg-Gaudin F, Tardif JC. Chronic heart rate reduction by ivabradine prevents endothelial dysfunction in dyslipidaemic mice. Br J Pharmacol. 2008;154(4):749–757. Johansen CD, Olsen RH, Pedersen LR, et al. Resting, night-time, and 24 h heart rate as markers of cardiovascular risk in middle-aged and elderly men and women with no apparent heart disease. Eur Heart J. 2013;34(23): 1732–1739. Mulder P, Barbier S, Chagraoui A, et al. Long-term heart rate reduction induced by the selective If current inhibitor ivabradine improves left ventricular function and intrinsic myocardial structure in congestive heart failure. Circulation. 2004;109(13):1674–1679. Reil JC, Tardif JC, Ford I, et al. Selective heart rate reduction with ivabradine unloads the left ventricle in heart failure patients. J Am Coll Cardiol. 2013;62(21):1977–1985. Reil JC, Hohl M, Reil GH, et al. Heart rate reduction by If-inhibition improves vascular stiffness and left ventricular systolic and diastolic function in a mouse model of heart failure with preserved ejection fraction. Eur Heart J. 2013;34(36):2839–2849. Swedberg K, Komajda M, Böhm M, et al; SHIFT Investigators. Ivabradine and outcomes in chronic heart failure (SHIFT): a randomized placebo-controlled study. Lancet. 2010;376(9744):875–885. Tardif JC, O’Meara E, Komajda M, et al; SHIFT Investigators. Effects of selective heart rate reduction with ivabradine on left ventricular remodeling and function: results from the SHIFT echocardiography substudy. Eur Heart J. 2011;32(20):2507–2515. Beere PA, Glagov S, Zarins CK. Retarding effect of lowered heart rate on coronary atherosclerosis. Science. 1984;226(4671):180–182. Fox K, Ford I, Steg PG, Tardif JC, Tendera M, Ferrari R; SIGNIFY Investigators. Ivabradine in stable coronary artery disease without clinical heart failure. N Engl J Med. 2014;371(12):1091–1099. Gent S, Kleinbongard P, Damman P, Neuhäuser M, Heusch G. Heart rate reduction and longevity in mice. Basic Res Cardiol. 2015;110(2):2. Heusch G. Pleiotropic action(s) of the bradycardic agent ivabradine: cardiovascular protection beyond heart rate reduction. Br J Pharmacol. 2008;155(7):970–971. Heusch G, Skyschally A, Gres P, van Caster P, Schilawa D, Schulz R. Improvement of regional myocardial blood flow and function and reduction of infarct size with ivabradine: protection beyond heart rate reduction. Eur Heart J. 2008;29(18):2265–2275. Kleinbongard P, Gedik N, Witting P, Freedman B, Klöcker N, Heusch G. Pleiotropic, heart rate-independent cardioprotection by ivabradine. Br J Pharmacol. 2015;172(17):4380–4390. Rienzo M, Melka J, Bize A, et al. Ivabradine improves left ventricular function during chronic hypertension in conscious pigs. Hypertension. 2015;65(1):122–129. Skalidis E, Hamilos MI, Chlouverakis G, Zacharis EA, Vardas PE. Ivabradine improves coronary flow reserve in patients with stable coronary artery disease. Atherosclerosis. 2011;215(1):160–165. Böhm M, Swedberg K, Komajda M, et al; SHIFT Investigators. Heart rate as a risk factor in chronic heart failure (SHIFT): the association between heart rate and outcomes in a randomized placebo-controlled trial. Lancet. 2010;376(9744):886–894. Böhm M, Borer J, Ford I, et al. Heart rate at baseline influences the effect of ivabradine on cardiovascular outcomes in chronic heart failure: analysis from the SHIFT study. Clin Res Cardiol. 2013;102(1):11–22. Castagno D, Skali H, Takeuchi M, et al; CHARM Investigators. Association of heart rate and outcome in a broad spectrum of patients with chronic heart failure: results from the CHARM (Candesartan in Heart Failure: Assessment of Reduction in Mortality and Morbidity) program. J Am Coll Cardiol. 2012;59(20):1785–1795. Fox K, Ford I, Steg G, Tendera M, Robertson M, Ferrari R; BEAUTIFUL Investigators. Heart rate as a prognostic risk factor in patients with coronary artery disease and left-ventricular systolic dysfunction (BEAUTIFUL): a subgroup analysis of a randomized controlled trial. Lancet. 2008;372(9641):817–821. Franke J, Wolter JS, Meme L, et al. Optimization of pharmacotherapy in chronic heart failure: is heart rate adequately addressed? Clin Res Cardiol. 2013;102(1):23–31. Logeart D, Seronde MF, Degroote P, et al. Raised heart rate at discharge after acute heart failure is an independent predictor of one-year mortality. Eur Heart J. 2012;32(Suppl 1):485. Böhm M, Perez A-C, Jhund PS, et al; I-Preserve Committee and Investigators. Relationship between heart rate and mortality and morbidity in the irbesartan patients with heart failure and preserved systolic function trial (I-Preserve). Eur J Heart Fail. 2014;16(7):778–787. Maeder MT, Kaye DM. Differential impact of heart rate and blood pressure on outcome in patients with heart failure with reduced versus preserved left ventricular ejection fraction. Int J Cardiol. 2012;155(2):249–256. Takada T, Sakata Y, Miyata S, et al; CHART-2 Investigators. Impact of elevated heart rate on clinical outcomes in patients with heart failure with reduced and preserved ejection fraction: a report from the CHART-2 Study. Eur J Heart Fail. 2014;16(3):309–316. Howlett JG. Does slow and steady win the race? J Am Coll Cardiol. 2012;59(20):1796–1798. Zorn-Pauly K, Pelzmann B, Lang P, et al. Endotoxin impairs the human pacemaker current IF. Shock. 2007;28(6):655–661. Li N, Csepe TA, Hansen BJ, et al. Molecular mapping of sinoatrial node HCN channel expression in the human heart. Circ Arrhythm Electrophysiol. 2015;8(5):1219–1227. DiFrancesco D. The role of the funny current in pacemaker activity. Circ Res. 2010;106(3):434–446. Heusch G, Baumgart D, Camici P, et al. alpha-Adrenergic coronary vasoconstriction and myocardial ischemia in humans. Circulation. 2000;101(6):689–694. Mesirca P, Torrente AG, Mangoni ME. Functional role of voltage gated Ca(2+) channels in heart automaticity. Front Physiol. 2015;6:19. Wilders R. Computer modelling of the sinoatrial node. Med Biol Eng Comput. 2007;45(2):189–207. Bogdanov KY, Vinogradova TM, Lakatta EG. Sinoatrial nodal cell ryanodine receptor and Na(+)-Ca(2+) exchanger: molecular partners in pacemaker regulation. Circ Res. 2001;88(12):1254–1258. Lakatta EG, DiFrancesco D. What keeps us ticking: a funny current, a calcium clock, or both? J Mol Cell Cardiol. 2009;47(2):157–170. Yaniv Y, Lakatta EG, Maltsev VA. From two competing oscillators to one coupled-clock pacemaker cell system. Front Physiol. 2015;6:28. Yaniv Y, Sirenko S, Ziman BD, Spurgeon HA, Maltsev VA, Lakatta EG. New evidence for coupled clock regulation of the normal automaticity of sinoatrial nodal pacemaker cells: bradycardic effects of ivabradine are linked to suppression of intracellular Ca(2)(+) cycling. J Mol Cell Cardiol. 2013;62:80–89. Yaniv Y, Lyashkov AE, Sirenko S, et al. Stochasticity intrinsic to coupled-clock mechanisms underlies beat-to-beat variability of spontaneous action potential firing in sinoatrial node pacemaker cells. J Mol Cell Cardiol. 2014;77:1–10. Tsuji H, Larson MG, Venditti FJ Jr, et al. Impact of reduced heart rate variability on risk for cardiac events. The Framingham Heart Study. Circulation. 1996;94(11):2850–2855. Ponikowski P, Anker SD, Chua TP, et al. Depressed heart rate variability as an independent predictor of death in chronic congestive heart failure secondary to ischemic or idiopathic dilated cardiomyopathy. Am J Cardiol. 1997;79(12):1645–1650. Kazmi SZ, Zhang ZH, Aziz W, et al. Inverse correlation between heart rate variability and heart rate demonstrated by linear and nonlinear analysis. PLoS One. 2016;11(6):e0157557. Mangin L, Swynghedauw B, Benis A, Thibault N, Lerebours G, Carré F. Relationships between heart rate and heart rate variability: study in conscious rats. J Cardiovasc Pharmacol. 1998;32(4):601–607. Dias da Silva VJ, Tobaldini E, Rocchetti M, et al. Modulation of sympathetic activity and heart rate variability by ivabradine. Cardiovasc Res. 2015;108(1):31–38. Böhm M, Borer JS, Camm J, et al. Twenty-four-hour heart rate lowering with ivabradine in chronic heart failure: insights from the SHIFT Holter substudy. Eur J Heart Fail. 2015;17(5):518–526. Kurtoglu E, Balta S, Karakus Y, et al. Ivabradine improves heart rate variability in patients with nonischemic dilated cardiomyopathy. Arq Bras Cardiol. 2014;103(4):308–314. Evans ND, Godfrey KR, Chapman MJ, Chappell MJ, Aarons L, Duffull SB. An identifiability analysis of a parent-metabolite pharmakokinetic model for ivabradine. J Pharmacokinet Pharmacodyn. 2001;28(1):93–105. Francois-Bouchard M, Simonin G, Bossant MJ, Boursier-Neyret C. Simultaneous determination of ivabradine and its metabolites in human plasma by liquid chromatography-tandem mass spectrometry. J Chromatogr B Biomed Sci Appl. 2000;745(2):261–269. Ragueneau I, Laveille C, Jochemsen R, Resplandy G, Funck-Brentano C, Jaillon P. Pharmakokinetic-pharmacodynamic modeling of the effects of ivabradine, a direct sinus node inhibitor, on heart rate in healthy volunteers. Clin Pharmacol Ther. 1998;64(2):192–203. De Ferrari GM, Mazzuero A, Agnesina L, et al. Favourable effects of heart rate reduction with intravenous administration of ivabradine in patients with advanced heart failure. Eur J Heart Fail. 2008;10(6):550–555. Steg P, Lopez-de-Sà E, Schiele F, et al; VIVIFY (eValuation of the IntraVenous If inhibitor ivabradine after ST segment elevation mYocardial infarction) Investigators. Safety of intravenous ivabradine in acute ST-segment elevation myocardial infarction patients treated with primary percutaneous coronary intervention: a randomized, placebo-controlled, double-blind, pilot study. Eur Heart J Acute Cardiovasc Care. 2013;2(3):270–279. Prondzinsky R, Lemm H, Swyter M, et al. Intra-aortic balloon counterpulsation in patients with acute myocardial infarction complicated by cardiogenic shock: the prospective, randomized IABP SHOCK Trial for attenuation of multiorgan dysfunction syndrome. Crit Care Med. 2010;38(1):152–160. Klöckner U, Rueckschloss U, Grossmann C, et al. Differential reduction of HCN channel activity by various types of lipopolysaccharide J Mol Cell Cardiol. 2011;51(2):226–235. Klöckner U, Rueckschloss U, Grossmann C, et al. Inhibition of cardiac pacemaker channel hHCN2 depends on intercalation of lipopolysaccharide into channel-containing membrane microdomains. J Physiol. 2014;592(6):1199–1211. Barbuti A, DiFrancesco D. The “fun” side of sepsis. J Physiol. 2014;592(6):1171. Ebelt H, Geißler I, Ruccius S, et al. Direct inhibition, but indirect sensitization of pacemaker activity to sympathetic tone by the interaction of endotoxin with HCN-channels. Clin Exp Pharmacol Physiol. 2015;42(8):874–880. Scheruebel S, Koyani CN, Hallström S, et al. If blocking potency of ivabradine is preserved under elevated endotoxin levels in human atrial myocytes. J Mol Cell Cardiol. 2014;72:64–73. Bonadei I, Vizzardi E, Sciatti E, et al. Is there a role for ivabradine beyond its conventional use? Cardiovasc Ther. 2014;32(4):189–192. Anter E, Jessup M, Callans DJ. Atrial fibrillation and heart failure: treatment considerations for a dual epidemic. Circulation. 2009;119(18):2516–2525. Maisel WH, Stevenson LW. Atrial fibrillation in heart failure: epidemiology, pathophysiology, and rationale for therapy. Am J Cardiol. 2003;91(6A):2D–8D. Fox K, Ford I, Steg G, Tendera M, Ferrari R; BEAUTIFUL Investigators. Ivabradine for patients with stable coronary artery disease and left-ventricular systolic dysfunction (BEAUTIFUL): a randomized, double-blind, placebo-controlled trial. Lancet. 2008;372(9641):807–816. Zugck C, Martinka P, Stöckl G. Ivabradine treatment in a chronic heart failure patient cohort: symptom reduction and improvement in quality of life in clinical practice. Adv Ther. 2014;31(9):961–974. Werdan K, Ebelt H, Nuding S, Höpfner F, Hack G, Müller-Werdan U. Ivabradine in combination with betablocker improves symptoms and quality of life in patients with stable angina pectoris: results from the ADDITIONS study. Clin Res Cardiol. 2012;101(5):365–373. Chan MM, Lam CS. How do patients with heart failure with preserved ejection fraction die? Eur J Heart Fail. 2013;15(6):604–613. Zakeri R, Borlaug BA, McNulty SE, et al. Impact of atrial fibrillation on exercise capacity in heart failure with preserved ejection fraction: a RELAX trial ancillary study. Circ Heart Fail. 2014;7(1):123–130. Bavishi C, Chatterjee S, Ather S, Patel D, Messerli FH. Beta-blockers in heart failure with preserved ejection fraction: a meta-analysis. Heart Fail Rev. 2015;20(2):193–201. Conraads VM, Metra M, Kamp O, et al. Effects of the long-term administration of nebivolol on the clinical symptoms, exercise capacity, and left ventricular function of patients with diastolic dysfunction: results of the ELANDD study. Eur J Heart Fail. 2012;14(2):219–225. Edelmann F, Musial-Bright L, Gelbrich G, et al; CIBIS-ELD Investigators and Project Multicenter Trials in the Competence Network Heart Failure. Tolerability and feasibility of beta-blocker titration in HFpEF versus HFrEF: insights from the CIBIS-ELD trial. JACC Heart Fail. 2016;4(2):140–149. Liu F, Chen Y, Feng X, Teng Z, Yuan Y, Bin J. Effects of beta-blockers on heart failure with preserved ejection fraction: a meta-analysis. PLoS One. 2014;9(3):e90555. Lund LH, Benson L, Dahlström U, Edner M, Friberg L. Association between use of β-blockers and outcomes in patients with heart failure and preserved ejection fraction. JAMA. 2014;312(19):2008–2018. Edelmann F, Wachter R, Schmidt AG, et al; Aldo-DHF Investigators. Effect of spironolactone on diastolic function and exercise capacity in patients with heart failure with preserved ejection fraction: the Aldo-DHF randomized controlled trial. JAMA. 2013;309(8):781–791. Pitt B, Pfeffer MA, Assmann SF, et al; TOPCAT Investigators. Spironolactone for heart failure with preserved ejection fraction. N Engl J Med. 2014;370(15):1383–1392. Pfeffer MA, Claggett B, Assman SF, et al. Regional variation in patients and outcomes in the Treatment of Preserved Cardiac Function Heart Failure with an Aldosterone Antagonist (TOPCAT) trial. Circulation. 2015;131(1):34–42. Gu J, Fan YQ, Bian L, et al. Long-term prescription of beta-blocker delays the progression of heart failure with preserved ejection fraction in patients with hypertension: a retrospective observational study. Eur J Prev Cardiol. 2016;23(13):1421–1428. Kosmala W, Holland DJ, Rojekt A, Wright L, Przewlocka-Kosmala M, Marwick TH. Effect of If channel inhibition on hemodynamic status and exercise tolerance in heart failure with preserved ejection fraction: a randomized trial. J Am Coll Cardiol. 2013;62(15):1330–1338. Simantirakis EN, Nakou ES, Kallergis EM, et al. Long-term effect of If-channel inhibition on diastolic function and exercise capacity in heart failure patients with preserved ejection fraction. Int J Cardiol. 2015;187:9–11. Fischer-Rasokat U, Honold J, Lochmann D, et al. β-Blockers and ivabradine differentially affect cardiopulmonary function and left ventricular filling index. Clin Res Cardiol. 2016;105(6):527–534. Adamyan KG, Tumasyan LR, Chilingaryan AL, Tunyan LG. Efficacy of long-term ivabradine therapy on prognosis, left and right heart functional parameters in patients with chronic heart failure and preserved left ventricular systolic function. Eur Heart J. 2015;36(Suppl 1):666–667. De Masi De Luca G. Ivabradine and diastolic heart failure. J Am Coll Cardiol. 2012;59(13 Suppl 1) E1009. Pal N, Sivaswamy N, Mahmoud M, et al. Effect of selective heart rate slowing in heart failure with preserved ejection fraction. Circulation. 2015;132(18):1719–1725. Kitzman DW. Conventional wisdom in heart failure treatment challenged again: does heart rate lowering worsen exercise intolerance in heart failure with preserved ejection fraction? Circulation. 2015;132(18):1687–1689. Shah SJ. Matchmaking for the optimization of clinical trials of heart failure with preserved ejection fraction: no laughing matter. J Am Coll Cardiol. 2013;62(15):1339–1342. Logeart D, Isnard R, Resche-Rigon M, et al; Heart Failure of the French Society of Cardiology. Current aspects of the spectrum of acute heart failure syndromes in a real-life setting: the OFICA study. Eur J Heart Fail. 2013;15(4):465–476. Mebazaa A, Parissis J, Porcher R, et al. Short-term survival by treatment among patients hospitalized with acute heart failure: the global ALARM-HF registry using propensity scoring methods. Intensive Care Med. 2011;37(2):290–301. Senni M, Gavazzi A, Oliva F, et al; IN HF Outcome Investigators. In-hospital and 1-year outcomes of acute heart failure patients according to presentation (de novo vs. worsening) and ejection fraction. Results from IN-HF Outcome Registry. Int J Cardiol. 2014;173(2);163–169. Aroutunov AG, Aroutunov GP, Volkova AL, Bylova NA. Prognosis of heart rate control on decompensated heart failure patients. Heart Lung Circ. 2008;17(1):S5–S6. Sargento L, Satendra M, Longo S, Lousada N, dos Reis RP. Heart rate reduction with ivabradine in patients with acute decompensated systolic heart failure Am J Cardiovasc Drugs. 2014;14(3):229–235. Cavusoglu Y, Mert U, Nadir A, Mutlu F, Morrad B, Ulus T. Ivabradine treatment prevents dobutamine-induced increase in heart rate in patients with acute decompensated heart failure. J Cardiovasc Med (Hagerstown). 2015;16(9):603–609. Link A, Reil JC, Selejan S, Böhm M. Effect of ivabradine in dobutamine induced sinus tachycardia in a case of acute heart failure. Clin ResCardiol. 2009;98(8):513–515. Doesch AO, Celik S, Ehlermann P, et al. Heart rate reduction after heart transplantation with beta-blocker versus the selective If channel antagonist ivabradine. Transplantation. 2007:84(8):988–996. Doesch AO, Ammon K, Konstandin M, et al. Heart rate reduction for 12 months with ivabradine reduces left ventricular mass in cardiac allograft recipients. Transplantation. 2009;88(6):835–841. Sekar B, Critchley WR, Williams SG, Shaw SM. Should we consider heart rate reduction in cardiac transplant recipients? Clin Cardiol. 2013;36(2):68–73. Zwicker C, Becker M, Lepper W, Koch KC, Westenfeld R. Cardiogenic shock due to tachycardiomyopathy after heart transplantation: successful treatment with ivabradine. Cardiology. 2010;116(3):174–177. Libhaber E, Sliwa K, Bachelier K, Lamont K, Böhm M. Low systolic blood pressure and high resting heart rate as predictors of outcome in patients with peripartum cardiomyopathy. Int J Cardiol. 2015;190:376–382. Hilfiker-Kleiner D, Haghikia A, Nonhoff J, Bauersachs J. Peripartum cardiomyopathy: current management and future perspectives. Eur Heart J. 2015;36(18):1090–1097. Haghikia A, Tongers J, Berliner D, et al. Early ivabradine treatment in patients with acute peripartum cardiomyopathy: subanalysis of the German PPCM registry. Int J Cardiol. 2016;216:165–167. Bonadei I, Sciatti E, Vizzardi E, D’Aloia A, Metra M. Ivabradine during cardiogenic shock: a clinical case and review of the literature. Heart Lung. 2015;44(1):57–58. Barillà F, Pannarale G, Torromeo C, et al. Ivabradine in patients with ST-elevation myocardial infarction complicated by cardiogenic shock: a preliminary randomized prospective study. Clin Drug Investig. 2016;36(10):849–856. Werdan K, Nuding S, Müller-Werdan U. Potential Pathophysiological Mechanisms in Septic Cardiomyopathy: An Overview. Frontiers in Myocardia. Vol. 1. Edited by Vasilios E. Papaioannou. Sharjah, UAE: Bentham Science Publishers Ltd. 2015:3–40. Sander O, Welters ID, Foex P, Sear JW. Impact of prolonged elevated heart rate on incidence of major cardiac events in critically ill patients with a high risk of cardiac complications. Crit Care Med. 2005;33(1):81–88. Hoke RS, Müller-Werdan U, Lautenschäger C, Werdan K, Ebelt H. Heart rate as an independent risk factor in patients with multiple organ dysfunction: a prospective, observational study. Clin Res Cardiol. 2012;101(2):139–147. Morelli A, Ertmer C, Westphal M et al. Effect of heart rate control with esmolol on hemodynamic and clinical outcomes in patients with septic shock: a randomized clinical trial. JAMA. 2013;310(16):1683–1691. Nuding S, Ebelt E, Hoke RS, et al. Reducing elevated heart rate in patients with multiple organ dysfunction syndrome by the I(f) (funny channel current) inhibitor ivabradine MODI(f)Y Trial. Clin Res Cardiol. 2011;100(10):915–923. Thomsen JH, Nielsen N, Hassager C, et al. Bradycardia during targeted temperature management: an early marker of lower mortality and favorable neurologic outcome in comatose out-of-hospital cardiac arrest patients. Crit Care Med. 2016;44(2):308–318. Swedberg K, Komajda M, Böhm M, et al; SHIFT Investigators. Effects on outcomes of heart rate reduction by ivabradine in patients with congestive heart failure: is there an influence of beta-blocker dose? Findings from the SHIFT (Systolic Heart failure treatment with the If inhibitor ivabradine Trial) study. J Am Coll Cardiol. 2012;59(22):1938–1945. Bocchi EA, Böhm M, Borer JS, et al; SHIFT investigators. Effect of combining ivabradine and β-blockers: focus on the use of carvedilol in the SHIFT population. Cardiology. 2015;131(4):218–224. Volterrani M, Cice G, Caminit G, et al. Effect of carvedilol, ivabradine or their combination on exercise capacity in patients with heart failure (the CARVIVA HF trial). Int J Cardiol. 2011;151(2):218–224. Simon L, Ghaleh B, Puybasset L, Giudicelli JF, Berdeaux A. Coronary and hemodynamic effects of S 16257, a new bradycardic agent, in resting and exercising conscious dogs. J Pharmacol Exp Ther. 1995;275(2):659–666. Ekman I, Chassany O, Komajda M, et al. Heart rate reduction with ivabradine and health related quality of life in patients with chronic heart failure results from the SHIFT study. Eur Heart J. 2011;32(19):2395–2404. Lesman-Leegte I, Jaarsma T, Coyne JC, Hillege HL, van Veldhuisen DJ, Sanderman R. Quality of life and depressive symptoms in the elderly: a comparison between patients with heart failure and age- and gender-matched community controls. J Card Fail. 2009;15(1):17–23. Juenger J, Schellberg D, Kraemer S, et al. Health related quality of life in patients with congestive heart failure: comparison with other chronic diseases and relation to functional variables. Heart. 2002;87(3):235–241. Riccioni G, Masciocco L, Benvenuto A, et al. Ivabradine improves quality of life in subjects with chronic heart failure compared to treatment with β-blockers: results of a multicentric observational APULIA study. Pharmacology. 2013;92(5–6):276–280. Dobre D, de Jongste MJL, Haaijer-Ruskamp FM, Sandermann R, van Veldhuisen DJ, Ranchor AV. The enigma of quality of life in patients with heart failure. Int J Cardiol. 2008;125(3):407–409. Dobre D, van Jaarsfeld CHM, deJongste MJL, Ruskamp FMH, Ranchor AV. The effect of beta-blocker therapy on quality of life in heart failure patients: a systematic review and meta-analysis. Pharmacoepidemiol Drug Saf. 2007;16(2):152–159. Udelson JE, Feldman AM, Greenberg B, et al. Randomized, double-blind, multicenter, placebo-controlled study evaluating the effect of aldosterone antagonisms with eplerenone on ventricular remodeling in patients with mild-to-moderate heart failure and left ventricular systolic dysfunction. Circ Heart Fail. 2010;3(3):347–353. Tavazzi L, Swedberg K, Komajda M, et al; SHIFT Investigators. Efficacy and safety of ivabradine in chronic heart failure across the age spectrum: insights from the SHIFT study. Eur J Heart Fail. 2013;15(11):1296–1303. Stewart S, Riegel B, Boyd C, et al. Establishing a pragmatic framework to optimise health outcomes in heart failure and multimorbidity (ARISE-HF): a multidisciplinary position statement. Int J Cardiol. 2016;212:1–10.